We’d love your help. Let us know what’s wrong with this preview of Awakenings by Hally Willmott. The Adisons have been running When sixteen-year old Jacey Adison’s parents tell her they must move again, she has never questioned their life style. Until now. When Jacey was two, her parents fled the protection of their birthplace, the mystical dimension of Nemele. Leaving was the only solution her parents believed might allow them to keep their family together and alive. To ask other readers questions about Awakenings, please sign up. I absolutely loved reading this book, the story line was unique and for me a breath of fresh air in the paranormal genre. The writing was wonderfully descriptive and rich in thought. The main characters were lovely and very relatable in today’s society I anxiously waited for months for this novel to be release, and I was hooked after the first page, the original storyline was very thought provoking and detailed every single development beautifully. Awakenings was a great read, full of mystery and intrigue that is only just setting up a series with a good amount of potential. I liked the world the author has created, it is quite different from the usual books I read and I really enjoyed it. The synopsis is spot on in its description of the upheaval Jacey is going to go through throughout the book. In effect, most of Jacey’s life has been a lie and all those close to her have perpetuated the lie. She knew she was different in certain ways but not how different she would become until the day her parents die and the lies/secrets begin to unfold, finally giving Jacey an insight into the ‘real’ life she has been protected from. I liked Jacey as a character, she was sweet and I liked the family dynamic they all had. I really enjoyed the powers that she begins to manifest throughout and her discovery that her dreams are linked to those. I think she held it together really well considering the amount of secrets people were keeping from her and had I been her, I would have been a lot more angry at those around me particularly when I felt that people were only around me as an obligation. I really liked her brother – Hudson – and his protectiveness of her, obviously when things start to be revealed we understand why but even before then you can feel the bond they share and it was nice, I also liked that he got some happiness from his situation too with a certain someone. I just stayed awake until 2 a.m. to finish this book.. needless to say full review will come later. Here are just a few words I will leave you with for now.. different, intriguing, mystical, magical, heartfelt, a breath of fresh air in the paranormal genre, and hell why not... a little bit strange! Now good night or good morning, whatever. I'm going to bed! I'm not going to add much because.. well you can read the synopsis to find out what the book is about and I think I pretty much said all that I just stayed awake until 2 a.m. to finish this book.. needless to say full review will come later. Here are just a few words I will leave you with for now.. different, intriguing, mystical, magical, heartfelt, a breath of fresh air in the paranormal genre, and hell why not... a little bit strange! Now good night or good morning, whatever. I'm going to bed! A very satisfying read, it started off slow paced but progressed in to an exciting, magical adventure. Jacey Adison has always had strange, colourful, lifelike dreams and has known there is something a bit different about herself and her family. However, she has never questioned what those differences are. Now that she is sixteen years old, the dreams are becoming even more intense and even weirder. When her parents are killed suddenly in a road traffic accident, she finds out Rating : 3.5 stars. Jacey Adison has always had strange, colourful, lifelike dreams and has known there is something a bit different about herself and her family. However, she has never questioned what those differences are. Now that she is sixteen years old, the dreams are becoming even more intense and even weirder. When her parents are killed suddenly in a road traffic accident, she finds out that she belongs to a unique, ancient, magical world. As I said the book starts off slow paced but I didn’t mind this as it gives us a chance to get to know Hally and her family. However there is a bit of telling rather than showing exposition which takes a bit from the pace and flow of the book. It is well worth persisting though as the world that Hally Willmott has created is beautiful, so beautiful that I wish this was a novel that had some illustrations as I would love a picture representation of some of the aspects described. There are some very unique elements in this book. It takes a while for Jacey (and so us) to find out about this world that she is so central to and what her true faith is. Once the reveal starts to happen, there is a lot of detail to take in, everything is vividly described and I loved it. Jacey possesses some rare abilities and I have a feeling with this first book, we have only seen the tip of iceberg. I have seen other reviews mention insta-love in relation to Jacey’s connection with Vincent in the magical domain of Nemele. However, I don’t see it like this. Vincent is a dream walker and so has been present in her dreams for a long time which helps to explain the intense connection between them. What I would like to have seen was a few more natural, fun, typical teenage moments between Jacey and Vincent, this would have given more of an insight and added more reality to the bond they have. I liked all the characters, even though I wished Jacey had asked more questions sooner so we could have discovered what was going on sooner! She was a bit too accepting of being fobbed off with excuses of needing to wait to find out the truth. If I knew my best friend and brother knew secrets I didn’t, believe me I would get it out of them! By hook or by crook, I would make them spill the details! Also, there is a large cast of characters to get to know and to keep straight, something I did find difficult at times. In fairness, I do think this is something that can be expected to an extent with any first book, especially one that has as much world building as Awakenings. Another thing I have to cover is the Harry Potter similarities; they do exist to a certain degree. However this book is in no way a copycat or watered down version of Harry Potter. I would think the author is a JK fan and has probably been inspired by her but she has created a very unique, strange, wonderful world with a very unique plot. Awakenings by Hally Willmott is a family-oriented supernatural tale centering on the life and times of the Adison family. Jacey’s parents are killed in an automobile accident, leaving her with her best friend Jen, her brother Hudson and her Aunt Grace to help pick up the pieces. Only a dream sequence brings her face-to-face with her dead parents, who reveal to her the true nature of her family history and her personal destiny. Jacey finds that her family are citizens of Nemele from an alternate Awakenings by Hally Willmott is a family-oriented supernatural tale centering on the life and times of the Adison family. Jacey’s parents are killed in an automobile accident, leaving her with her best friend Jen, her brother Hudson and her Aunt Grace to help pick up the pieces. Only a dream sequence brings her face-to-face with her dead parents, who reveal to her the true nature of her family history and her personal destiny. Jacey finds that her family are citizens of Nemele from an alternate universe that manifests itself on earth as the gods, goddesses and monsters of fable and fiction. Jacey finds herself caught in a conflict between the Nemelites and the Yietimpis in a struggle for mastery of the universe. The theme of fidelity resonates throughout the novel as the foursome set out on the course of Origin which will reveal to them the true nature of the crusade ahead. Their bond is soon extended to include their Nemelite brethren, with the trusty Vincent Wills as the guide who helps Jacey along the next part of her quest. Eventually Jacey realizes her own journey is part of a greater conflict between the Elders and the Sect of Yietimpi. The test is great and the road proves treacherous, but Jacey and her friends are intent on helping her find her place as a true student of St. Nemele. I wouldn’t be surprised to see a sequel, and neither will you. Pick up a copy of Awakenings by Hally Willmott and climb aboard for a great adventure. Another great series in the paranormal genre like The Tapestry Series by Henry Neff. Amazing and weird book.So strange yet I loved it - Full review to come! Synopsis- Encase you don't know what the book is about! When sixteen-year old Jacey Adison’s parents tell her they must move again, she has never questioned their life style. Until now. When Jacey was two, her parents fled the protection of their birthplace, the mystical dimension of Nemele. Leaving was the only solution her parents believed might allow them to keep their Amazing and weird book.So strange yet I loved it - Full review to come! Now I received this for review from the author so I spent my last weekend reading this and I couldn’t put it down- this book I don’t even know how to review this book as it is so weird and different. I think this book will either follow the love it or hate it idea because you will either love it or hate it which I can understand why people would love or hate it. But yeah this book was intense and like nothing I have read before!! When reading this you should be ready to open your mind to new YA type books, this book isn’t your average book. Its different and weird we do get a load of information but I think the author has done it so you may be confused at first but gradually you get used to it – and it did take me half the book really to get into this book as it was so weird and different. The whole world that we have build is just amazing and it what I totally loved it – the potential things that could happen in this series is endless, and I want to know more about and be introduced to more and more characters. It’s weird and wonderful and I want to know so much more about the people of Nemele. The plot is slow I won’t lie to you as first it was fast and quick paced but after that initial fast bit it kind of slowed down but I never wanted to put this book down as you want to read on to find out what’s going on, as there is this huge mystery and you want to know what is going on and what will happen. Towards the end it picked up a lot and we had yet again a lot of information being introduced to us which can be hard to follow. You will be confused and I was for the best part but eventually I got used to the name s and the weird happenings and I really enjoyed the book. Jacey... I don’t know what to think about her we had these moments where I was like “ HELL YEAH YOU KICK BUT” but then we had these moments where I didn’t understand why she was doing what she was doing. She was ok with all these weird happens ( and they were weird) saying she was raised that way but even if I was raised that way I would probably want answers more that accepting it. But saying that there were moments where Jacey shone through and just took hold of the situation I just wish there had been more of them and I think that towards of the need of the book we see this happening and I am hoping in the next book! Also her and her relationships ( with everybody) She would be mad one moment for them keeping things from her but a page later she would be fine with it. I would still me mad at them from keeping so much from her. And she kept on saying it was annoying her bus she did nothing about it, If I was her I would be demanding answers. All the other characters I liked they where interesting and just fun to read about I totally adore Vincent it is kind of insta-love but it developed more than just insta- love and I want to know what will happen to them. I feel like we also need to know more about her best friend as she felt more like a back role and I just wanted to know more about here and how they come to be best friends. I received this book through Reviewer Match Services for free, where I am a reviewer, in exchange for my honest opinion. I’ll start by saying this: the book was amazing. It was fantastic, different, wonderful, magical, and all things lovely in a book filled with suspense and the unknown. For a YA paranormal book, I am always looking for a certain writing style, something that screams “young viewpoint.” It can be difficult for an author to write with a youthful voice, yet Willmott does it with ea I received this book through Reviewer Match Services for free, where I am a reviewer, in exchange for my honest opinion. I’ll start by saying this: the book was amazing. It was fantastic, different, wonderful, magical, and all things lovely in a book filled with suspense and the unknown. For a YA paranormal book, I am always looking for a certain writing style, something that screams “young viewpoint.” It can be difficult for an author to write with a youthful voice, yet Willmott does it with ease. I won’t bore you with a retelling of the synopsis; you can read that about the book for yourself. So I’ll just give you my opinion of the book and the characters. Jacey had me hooked from page 1 and kept me interested until the end. Jacey is a gifted teenager of 16 who doesn’t know her own powers and is frequently kept in the dark about her true destiny by everyone around her. She takes most of it in stride, including the tragedy and horror that touches her life early on in the book, and she grows into her own very quickly. Nothing surprises her, not really, and she already has vast knowledge tucked away in that head of hers about things that most of us cannot fathom to understand, let alone accept. It just comes out of her at will when she sees or experiences something totally weird, unexplainable or strange. She is a powerhouse, an anomaly the likes of which none have seen…and I don’t think even she understands yet how much of one she is. I hope to see her grow more in future books. She very quickly won over my heart. Hudson is the type of brother I think every sister wishes she had. He’s cute, charming, protective, loving, supportive, and heck, even annoying…everything a big brother should be. I loved his character and how he just accepts and shoulders massive responsibility when tragedy hits, without a single backward glance. It is what it is, therefore he handles it with amazing calm. Jen is the best, best friend a girl like Jacey could have. She is supportive, friendly, loving, caring, always there when needed and protective too. Jacey didn’t learn until later on in the book how much of a friend Jen is, or why, but when things come out, it’s nothing short of wonderful to see the progression of their friendship into something more solid and long lasting. I can truly see a future between them that includes the entire family, and that is special. Aunt Grace is that one family member that Jacey, Hudson (and even Jen) can rely on. She’s the rock, the voice of reason, the caretaker, the love and support, and yes, the adult. Once tragedy hits, and you learn just how much it affects her and why, her ability to stand up, take charge, and keep things sane is really admirable. Vincent is the hunky, mysterious, completely risky, yet also comforting and supportive, wise beyond his year’s sort of boy that I can totally see Jacey falling completely head over heels in love with. I can’t wait to read what more is to come from their budding relationship in future books. Disclaimer: I received a copy of this book for free as part of the Blog Tour in exchange for an honest review. My thoughts: Awakenings is the first book in the new Young Adult Fantasy series Elementals and it's Hally Willmott debut novel. The book portraits the mysterious, strange and uniquely fresh story of Jacey Adison. Jacey is a sixteen-year-old girl who has always know she's not normal, because no matter where she goes with her nomad family, she never seems to fit in. That's until they arrive Disclaimer: I received a copy of this book for free as part of the Blog Tour in exchange for an honest review. Jacey is a sixteen-year-old girl who has always know she's not normal, because no matter where she goes with her nomad family, she never seems to fit in. That's until they arrive to Hewfawe, North Ontario, where she meets Jen -her best friend- and she finally stars feeling like she belongs. It's been over a year now since they first arrived and that's the longest time they've stayed in the same place. But something gets in the way: Jacey is having those weird dreams again, the ones that start with a lot of colors and feature this blue-eyed being she finds so comforting and mysterious at the same time. This new dream is especially bad though, because she sees her parents get swallowed by a terrifying darkness. She knows she should say something, warn them, but she cannot stand the idea of moving out again, so she keeps it to herself for a while until she feels the need to tell Hudson -her big brother- about the dream, because there is something about it so haunting and it doesn't feel right. But it's too late, somehow her parents had got into a mysterious car accident and now they're dead. Along with the pain, the loss and the guilt for not telling them sooner about the dream, Jacey now has to deal with another moving, another city, another school and all the weird dreams and experiences she's been having without the guidance of her parents. Luckily for her and Hudson, they still have Aunt Grace who has taken them under her care and is driving them to their new home, Nemele, where their parents used to live. But there is something, some kind of danger that everyone seems to be aware of, except for Jacey that is. Soon she will discover she is, indeed, very different and that she has amazing powers she never knew of, which makes her part of the Nemelites, a secret society her parents belonged to, but at the same time those powers put her in a huge danger, because the Yietimpi, their eternal enemies are now after her, expecting to use her to their advantage. On top of that she unexpectedly meets the blue-eyed guy who's been haunting her in her dreams. And learns that everything is so much more complicated that she would have ever imagined. What I love most about this book was the world building. It's a fresh concept and I love how the idea of the secret society and this whole new dimension plays out. I think it's pretty original, I for sure haven't read anything like it before. I did have some problems with the book, though. The first one was that it wasn't easy for me to feel related to the main character, Jacey. She's not annoying or whinny (the type of character I hate) but somehow she didn't seem all that realistic to me. I mean, her reactions were too passive... I'm not looking for a drama queen, but come on! The things that are happening to her are huge! Why doesn't she freak out like a normal person? But the more I read, the less I care about that, because the story was truly interesting and Jacey also started to seem more relatable to me. The other thing that bugged me were the little summaries below every chapter title. There were like four lines telling you basically what's coming next. I do not like spoilers, so if you don't like them either, don't read those lines. At first they were driving me crazy, but then I just choose to ignore them and everything went better. Jacey is our main character, who at 16, has had some very strange dreams. Dreams that have caused her and her family to have to move on multiple occasions. Jacey, however, is unaware of these reasons. She can't help but feel that her family is keeping things from her. Jacey was a pretty likeable protagonist, and I found myself really empathizing for her, as she is constantly kept in the dark for her own protection. I can imagine how frustrated she must feel that her brother, her parents, her aunt, and even her best friend always seem to know things she doesn't. Hudson, her older brother, is very protective of her and while that would irritate me, it was actually very sweet. The two depend and lean on each other in times of need and I think it was important to set their relationship up that way. Jen, Jacey's best friend, is loyal and while she is harboring a few secrets, she cares for Jacey and once the truth is revealed, she hates that she had to lie to her friend, even if it was for protection. She is able to accompany Jacey and Hudson to their new home in Nemele, after they are forced to move yet again to live their aunt. Jacey and her brother Hudson's world is rocked to the core as they experience a horrific tragedy. This event causes a spiral of new events that will change their lives completely. They must depend on each other and will once again have to uproot their lives and begin anew. However, thanks to their aunt and close friend, Jen, they will not be alone. As Jacey continues to experience these strange dreams, she also begins to pick up on bits and pieces of conversation between the others that she doesn't understand and she sees things that she can't explain. Not to mention, a boy with clear blue eyes is also making an appearance in her dreams. A boy who makes her feel safe- and she is inexplicably drawn to. Vincent, we later learn his name is, is able to communicate with Jacey through her dreams. He is her safe haven, if you will, and is able to calm her when she is afraid. This is a bit of insta-love, which I am not usually a fan of, but they do have an actual connection that we learn about towards the end, so it's not completely out of nowhere. When the two finally meet in person, he is kind and patient, and genuinely wants to help make Jacey's transition to a new place as easy as possible. We are introduced to a few more key characters toward the end, that I'm sure we will see more of in the next novel. Jacey Adison's life has always lacked a sense of permanency. She's always been the new kid, the one whose family could - at any time, or at a moment's notice - pack up and move...leaving everything behind. But there are some things you can't run from forever. Things that Jacey's parents have tried to protect her and her brother Hudson from, time and time again. Things that are intent on breaking their family apart. Secrets bring us together. Secrets tear us apart. As Jacey begins to question the circumstances surrounding her parents' death, she also begins to wonder if everything in her life is as black and white as she once believed. Dreams that she once thought were the figments of her slumbering mind may have sinister connotations, holding in them the key to Jacey's past, her legacy and her future. People who she once thought were friends may have roles in her destiny that she never imagined. But one thing's for sure: Jacey's family is keeping something from her. And she'll stop at nothing to find out what it is. Jacey's dreams become more and more frequent - muddled and confusing they bombard her with the forms of her parents, lurking evils and a pair of piercing blue eyes. The lines between dreams and reality starts to blur, and a sense of deja vu settles over her as she is faced with people whom she has never met and yet feels drawn to. People who seem to know more about Jacey than she does. People who are not of this world. A people called the Nemele. As the secrets of her heritage and her destiny are revealed, Jacey will be forced to come face to face with shocking truths - developing rare mystical abilities, forging unbreakable bonds, and confronting the evil that her parents have tried to shield her from for so long. Jacey has the power to save the world or destroy it, making her a valuable chess piece coveted by both sides of an age-old battle. But which side will prevail? Finality. Answers. Introspective. Trust. Hope. A journey of faith. A journey of fate. I was completely engrossed with this book from the beginning all the way to the end. Great writing style, the author Hally Willmott did a great job in describing the characters and the world to me. I loved Jacey's character, so young but we can see how much she grows through all the tragedies she has to face. She isn't surprise that magic is real and she faces it with enthusiasm and strives to learn more and more about this world she is a part of. I loved that she was always questioning things, not because she didn't believe it but because she wanted to know more. I also loved Hudson, her big brother, a brother I wish I had. He is overprotective, loving, sometimes annoying but always by Jacey's side when she needs him .Regardless of the pain and grief he's in, he makes sure his little sister is okay. As an older sister, I can understand that taking on the responsibility for the young siblings and Hudson does a great job at that. Now Jen, Jacey's bestfriend is also an amazing friend, always there for Jacey, like a sister to her. Its the type of friend everyone wants. Jacey's parents are such an awesome couple and great parents. They love their children and would do anything to protect them. Aunt Grace, wow, she was also awesome. I know it sounds repetitive, but all of these characters are very protective, especially of Jacey. I love that aspect of this family because you can tell how much love they have for one another.Vincent, is charming, mysterious but also protective and I can't wait to read more about all these characters and how they continue to support Jacey on her journey. For this being the first book, hoping there are more of course, Hally Willmott did a great job at building the world for the readers. She doesn't throw it all in one page and expects you to understand it. It flows throughout the entire book and doesn't overwhelm or confuse you. I loved the connection with all fairy tales and the Greek Mythology, and I can honestly say this world sounds so amazing and wish I could be a part of it. It was a great read so I recommend this to all those who enjoy fantasy and paranormal. I was absolutely captivated by Awakenings! Seriously, it is books like this that make me wonder how I functioned before Amazon's Kindle apps letting me read on any device... so I almost never have to put the book down. If you are looking to escape your reality for a bit, then you have to pick up Awakenings. I was so engrossed that I lost complete track of time! So here is why I fell in love with Awakenings. First, it is so well written! Hally Willmott doesn't make the reader imagine any details. I was absolutely captivated by Awakenings! Seriously, it is books like this that make me wonder how I functioned before Amazon's Kindle apps letting me read on any device... so I almost never have to put the book down. If you are looking to escape your reality for a bit, then you have to pick up Awakenings. I was so engrossed that I lost complete track of time! So here is why I fell in love with Awakenings. First, it is so well written! Hally Willmott doesn't make the reader imagine any details. Instead, she acts as our tour guide as we experience this entirely new world that we otherwise could never have even dreamt of. She vividly describes not only every sight and sound, but emotion, smell, and texture. So as readers, we are not just reading a story, we are experiencing it along with the characters. Second love, the characters. Even when 16 year old, Jacey's world is flipped upside down, she remains a strong character. Yes, she does have to fight against feelings of insecurity, but let's be honest here... what 16 year old doesn't? For me, the range of Jacey's emotions were one thing that really made the story believable and brought it to life. And of course, there is Vincent... oh Vincent. There is a little bit of a Beautiful Creatures type bond between Jacey and Vincent in the beginning where she only knows him in her dreams, and even then can only see his brilliant blue eyes. But once they meet, he is her anchor. And isn't that what all of us girls want in our men, an anchor? So by the end of the book, you will want to push Jacey out of the way a bit (even though you love her) just to get your hands on Vincent because let's face it... he is perfect. Awakenings is weird,wonderful and totally worth reading!An amazing first book in a new and mysterious series by promising debut author Hally Willmott. 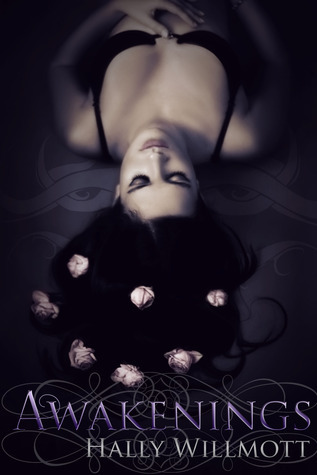 The heroine of this book is Jacey,a sixteen-year-old girl with odd dreams full of colors,auras and an entity with crystal blue eyes that she can't seem to get out of her head.She always knew that she wasn't a normal teenager but nobody told her anything.So when one day her parents die in a mysterious car accident,Jacey and her brother Hudson are left behind and get to live with their aunt in Nevaeh, their mother's hometown.Along with them,comes Jacey's best friend and Hudson's more-than-a-friend-girl,Jen. All seems good so far,but that changes when an unexpected attack by a being that is not human both frightens and confuses Jacey,because during the attack she unleashes her true powers and that makes her two things:a) a member of the Nemelites,a secret society that has existed for thousands of millennia and b) a target for the Yietimpi, Nemelites' eternal nemesis. And that's not all.Jacey is the only one who can see her parents' spirits and allow others to see them as well. Apart from all this,she's still a teenager who must attend high school.So new town,new school. On their first day Jacey,Hudson and Jen are supposed to meet Vincent,a boy who will show them around.Imagine Jacey's surprise when she sees him and realizes that Vincent is the boy she sees in her dreams.And it gets more complicated because their school is in Nemele,their real home, which is in another dimension. The clock is ticking and there's not much time left because the Yietimpi are lurking in the shadows waiting for the right time to attack and capture Jacey. I thought this book was a bit strange and weird, sometimes in a good way, and sometimes in a bad way. Awakenings was unexpected, I thought it was going to be a paranormal fantasy story about a world other than the human existence but it was a bit complicated than that. Well, it was a bit different that what I was accustomed to. First we get to meet Jacey, she is quiet and has a best friend called Jenny. We also get to meet her brother, I have a bit of a problem when I was wondering if he was older or younger than Jacey. Sometimes he acted as though he was older, but sometimes he acted as though he was younger. The story leads on with Jacey wondering why their family keeps moving after her parents' sudden death during a car accident. I have to say, for me, Jacey was a bit weak. I mean, she acted as though I could just pinch her and she would fall in a heap. Or maybe that was because I'm more used to brave and strong girls (you know what I mean? GIRL POWER!!). But Jacey seemed to accept what everybody says to her. This story was really confusing at first, and I found it really hard to understand until I was about 50% through. This book was a bit slow-going and if it was a bit more fast-paced, it would've been really exciting. Jacey's parents had been moving her and her brother Hudson all their lives. she never thought about questioning their decisions, until now when she found her parents dead, killed in an accident that the police claimed was no accident. Aunt Grace, her mother's twin sister took the siblings in, brought them back to her house and their birthplace. they were the Nemelite, people that held magical powers, always hunted by those who longed for powers. her parents hid them on Earth, concealing her true Jacey's parents had been moving her and her brother Hudson all their lives. she never thought about questioning their decisions, until now when she found her parents dead, killed in an accident that the police claimed was no accident. Aunt Grace, her mother's twin sister took the siblings in, brought them back to her house and their birthplace. they were the Nemelite, people that held magical powers, always hunted by those who longed for powers. her parents hid them on Earth, concealing her true lineage from her with the hope keeping them safe. i received a free e-book from the author in exchanged for a review. brought up in a different way than other Nemelite, Jacey knew nothing about her birthright until her parents' death. to make things worst, she possessed a rare ability even among the Nemelite, which will caused her to become the savior or downfall of her people. the intensity of the plot remained high throughout the book, making it impossibly difficult to put down once i got a slight taste of it. for the first half of the book, the mysteriousness and suspense was quite frustrating to deal with yet at the very same time, curiosity was eating me from within. i was more than surprised to find myself not skipping pages just to know what happen next. soon, getting a glimpse of Jacey's ability was so rewarding that i only wanted more doses of it! I loved this story!!! It's awesome. The characters are developed and mature and the dialogues are to the point and crisp. I loved the mystery and suspense, it kept me hooked to the story till the end. The writing style of the author is remarkable and the detail descriptions that she delivered here th I got this book from the author, free of cost, in exchange of an honest review from my side. The writing style of the author is remarkable and the detail descriptions that she delivered here through her enriched words really won over my heart and made me a part of the world that the author created so beautifully and most importantly the execution is brilliant which really made me believe in the plot and the characters. The story is totally unpredictable with unknown twists and turns that are sure to shock you. The background information is good and I didn't feel lost while going in to the details of Nemele. Over all a great read that I would definitely recommend to all the fabulous readers out there. I'm sure you guys will enjoy this fresh and unique story as much as I did. 3 stars or a strong 2.5. This is a tough rating for me actually. I didn't NOT like the book, but I had to slog through it. The writing is well done, the characters for the most part are lovely. I felt Jacey was a little juvenile for her 16 years. Jacey, and thus us, were given no hint or insight to what was going on in the story until 3/4 of the way through. I understand the need to build suspense but WOWZA. With all the crazy weird things happening around her, one would figure at some point Jac 3 stars or a strong 2.5. This is a tough rating for me actually. I didn't NOT like the book, but I had to slog through it. The writing is well done, the characters for the most part are lovely. I felt Jacey was a little juvenile for her 16 years. Jacey, and thus us, were given no hint or insight to what was going on in the story until 3/4 of the way through. I understand the need to build suspense but WOWZA. With all the crazy weird things happening around her, one would figure at some point Jacey would demand some answers a bit more. Once we do start getting those answers, the book is finished. The story was about a world that is parallel to our own, except for Jacey's weird dreams and people having glowing colors. And then suddenly we are thrust into a Hogwarts-esque school with fairies and Zeus and elves. It may have been a smoother transition for me if Jacey had found it more bewildering as well. I love this book and highly recommend it to all..young and old. The author tells the story with such vivid description that it brings you right into the book. You find yourself reading and visualizing the characters, the worlds, the buildings and the details and emotions described are so good you start believing you know these characters and that this alternate realm truly exists. I find the characters are easy to relate too and you cant help but love Jacey. She is sweet but does show a side you I love this book and highly recommend it to all..young and old. The author tells the story with such vivid description that it brings you right into the book. You find yourself reading and visualizing the characters, the worlds, the buildings and the details and emotions described are so good you start believing you know these characters and that this alternate realm truly exists. I find the characters are easy to relate too and you cant help but love Jacey. She is sweet but does show a side you wouldn't want to mess with. I really enjoyed how the author brought familiar characters/fairy tales common to most people and gently immersed them into the story giving you just a little bit of familiarity among the unfamiliar. This again plays on the readers ability to visualize, relate and fully experience the story. I do love a great fantasy book and this one has lots of strange things without explanations happening every time. But the best part is for me was learning about a new world or as this case, a different dimension. I really liked Jacey and the story kept me hooked on her discovering's and the challenges she faced every day, but it took me awhile to actually get in the book, hence the 4 star rating. Jacey is so full of live and she’s mostly not afraid of her future and what magic may bring to her li I do love a great fantasy book and this one has lots of strange things without explanations happening every time. But the best part is for me was learning about a new world or as this case, a different dimension. I really liked Jacey and the story kept me hooked on her discovering's and the challenges she faced every day, but it took me awhile to actually get in the book, hence the 4 star rating. Jacey is so full of live and she’s mostly not afraid of her future and what magic may bring to her life, it was really interesting seeing things happening and how much she suffered after her parents died right in the begin, but Jacey went through with her life and discovered a great deal of danger and drama. I liked the book. It is different from what I usually read but I did enjoy it. I look forward to reading the rest of the series and I would like to congratulate Hally on writing such a great book. I would also like to thank Hally for coming to my school, CVDCS back in 2013 to introduce us to the book. the story is interesting but complicated. the main character accepts what she is told and never demands answers which in my opinion doesn't seem genuine. why doesn't she push for answers? why is the answer not yet good enough and why allow herself to be blindly led for the entire story? overall a good story though. I will NOT read this! There is too much info-dumping about characters that are barely in the book, insta-love (I know it is there), a hot guy with, "beautiful, piercing blue eyes", and the main character is keeping secrets for no good reason. I can't. After trying to attempt "Thorn Abbey" I have no patience for this book. DNF! Loved this Book! Kept me turning the pages, just couldn't put it down. The way she pulls you into the story and the lives of the characters is wonderful. I can not wait to read the rest of the series! Did start rather sad and I did get emotional which is a good thing as meant I was invested! However most of the action was crammed in the last bit of the book and got rather confusing to follow! Could just be me tho as was reading whilst moving house! Awakenings by Hally Wilmott is a good book. The book was full of great characters and lots of action. However, it was also a little confusing. I got lost in all the science fiction stuff. I kept trying to piece everything together but finally got it at the end. I really enjoyed reading this book. I liked how the story strung you along to the end to find out who/what/where the main character, Jacey, was all about, but at the same time, I felt like it took a bit too long. Either way, I highly recommend this book. Awakenings was difficult to get into at first, but there was a lot to learn about this new world that Jacey was discovering. The more I read, the more I wanted to keep reading. Willmott has created a creative, fascinating realm filled with intriguing characters and a gripping storyline.